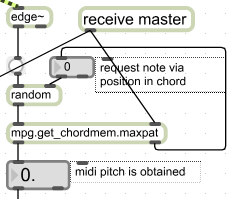 This object allows you to access current prevailing harm structure from the MPG network and choose pitches based on their position within the chord. It has functions very similar to the get scalemem abstraction. inlet 1 - An integer representing the index within the overall chord. The chord structure array contains values representing the MIDI pitches for a given chord. When a 0 is received, the array looks for the value at the 0th position in the array and outputs the proper MIDI pitch value. The array is mapped over a 10 octave (+5/-5) range so that register shifts are easily used. 0 represents the lowest note in the harmonic structure as assigned by the network. 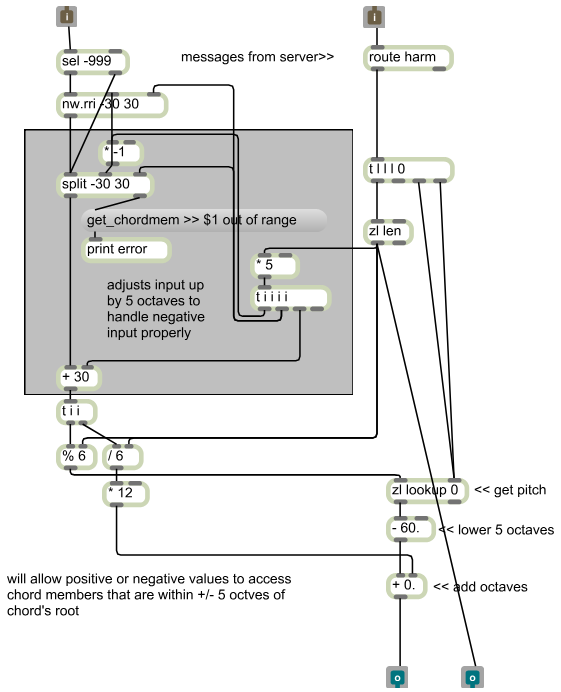 Negative values access octaves below the lowest note, while positive values access octaves above. The value of -999 is reserved to access a random value with the 10 octave range. inlet 2 - Musical structure messages sent from the master via the musiclinks object. You will very likely get erroneous data until messages have been received here. The "harm" message is the only message used. outlet 1 - MIDI pitch value corresponding to a given index. The value is output as a floating point number, since fractional values are permitted by the MPG network. These can be used to easily control the pitch of a user-designed synthesizer. Below you can see an image of the source patch for this abstraction. The included comments provide some insight into how the patch works.